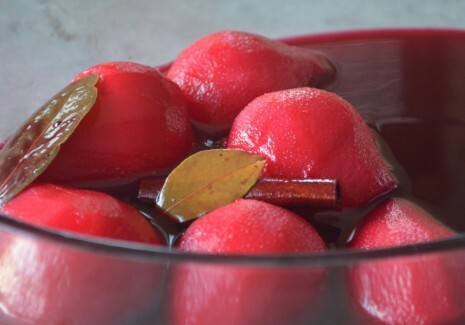 SCARLET POACHED PEARS FOR CHRISTMAS | Jane Lear. Writing on Food and Travel. Desserts that are both easy and spectacular are all too rare. That’s why it pays to keep a running file of them, and if they happen to be gluten and/or dairy free, or not terribly fattening, then so much the better. This time of year, at the top of my list are the scarlet poached pears developed by my former Gourmet colleague Paul Grimes, for the September 2008 Paris issue. Because poached pears rarely look as good as they taste, Paul took a cue from a dessert at Le Chateaubriand, which uses a beet to intensify the pears’ hue. I think the red glassware that you see at Paris flea markets may have also had an impact; Paul’s informed, very painterly eye is one of the reasons he is such an extraordinary food stylist. If you or yours don’t happen to like beets, no worries: You can’t taste them in the least, and the fresher and juicier the beet, the deeper in color the fruit will become. My beet was less than optimal; I’d forgotten to buy one at the farmers market, and the gnarly root I picked up at the grocery store had been languishing in the bin a bit too long. Still, it did the trick, and the poaching transformed not just the pears, but the less-than-stellar beet—it was almost candied, and I ate it standing over the sink. 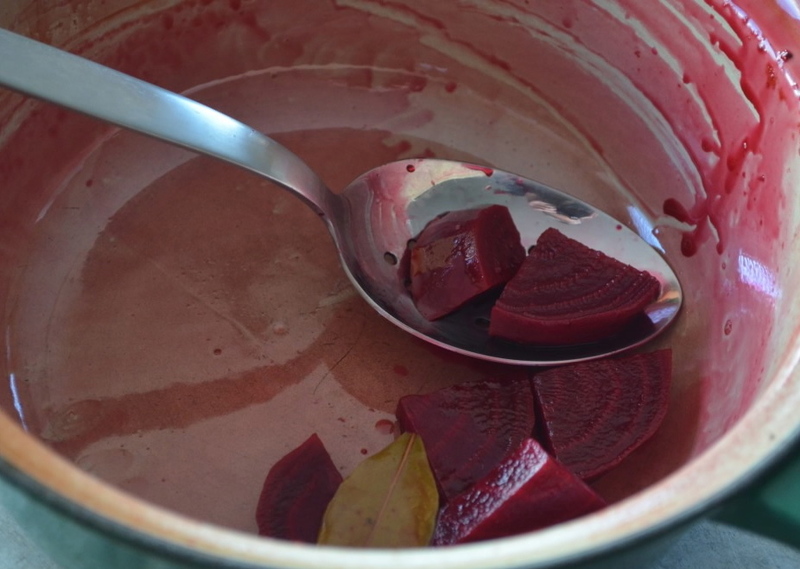 Beets have long been used as a dye for textiles and food. Before the advent of artificial colorants, they put the “red” in red velvet cake, for instance, and they turn Easter eggs a delicate mauve. The vegetable’s saturated color, like that of bougainvillea, amaranth, and the flowers of some cacti, comes from pigments called betalains (from Beta vulgaris, the Latin name of the common beet), specifically, a purple pigment called betacyanin and a yellow one called betaxanthin. Betalains are extremely unstable—they leak when cut, cooked, or exposed to air or sunlight. They aren’t nearly as common in plants as the anthocyanin pigments found in all manner of foods—including berries, grapes, cherries, plums, carrots, and black rice—and so are considered a relatively new class of dietary antioxidants. Now, about poaching, one of the gentlest culinary techniques. Although it isn’t complicated, you do want to be mindful of the heat. You don’t want the liquid to vigorously boil—otherwise, whatever it is you’re cooking will either break apart or toughen. A lower flame allows you greater control and precision. The end result—whether you are poaching chicken, say, or eggs or fruit—should possess the quality of moelleux (mwall-yew)—a soft, velvety mouthfeel that is completely, captivatingly French. No surprise, really, that there’s not an English equivalent of the word. Covering the pears with a round of parchment paper as they poach encourage them to cook and color evenly. To help them stay covered with liquid, try placing a small saucer on top of the parchment as they cook. If you are at all resistant to the idea of poached pears, you’ve likely been scarred by having to grapple with one that threatened to skid across the table when pierced with a fork. This usually happens during a first date or dinner with the boss. But understanding moelleux—the pears should be so tender they practically melt in your mouth—is a real game changer. The key to success is very, very basic: You must cook the pears until they are done. Since the pears may be of slightly different sizes or at different stages of ripeness, test them all instead of just one. When you insert a small skewer (a turkey lacer works brilliantly) or paring knife, it should glide in but the flesh should still feel solid, not mushy. Then don’t delay—take the pears off the heat and cool them down quickly, so they don’t overcook. Paul calls for Forelle pears, an old variety that holds its shape well during poaching; small Bosc pears also work. (If you’d like to know more about pears in general, you’ll find my shopping, cooking, and eating guide to pears here.) The recipe also specifies Orange Muscat, which isn’t the easiest dessert wine to find. Although another muscat won’t have the same alluring orange-apricot aroma, it will still be delicious. You’ll want to serve these with a fork, for stabilizing the pear, and a dessertspoon, for scooping flesh and juice. Merry Christmas! Happy Hols! See you soon in 2014. If your pears are very small or ripe (instead of firm-ripe), then set the kitchen timer for 20 minutes, say, instead of the 35 to 40 minutes specified below. And if the pears are indeed done more quickly, then transfer them to a bowl to cool, remove the bay leaves and cinnamon stick, and continue to simmer the poaching liquid until thickened and syrupy. 1. Bring wine, beet, sugar, lemon juice, cinnamon, and bay leaves to a boil in a 1½- to 2-quart saucepan, stirring until sugar has dissolved. Posted: December 23rd, 2013 under Christmas, Gourmet magazine, people + places, recipes.